White root rot, caused by the fungus Scytinostroma galactinum (formerly Corticium galactinum), has been known as a parasite of apple trees for many years and is widely distributed (Canada to Texas and westward to the Pacific coast, Europe, West Indies, and Japan). It occurs in both bearing and non-bearing apple orchards. Other hosts include a wide variety of woody plants, ornamental shrubs, and herbaceous perennials, including white pine, ash, peach, blackberry, dewberry, Japanese wineberry, dogwood, sumac, white campion, holly, and kalmia. The fungus causes a decay of firs, western white cedar, and spruce. When present in orchards, the disease usually is on trees set on newly cleared land or near woods. 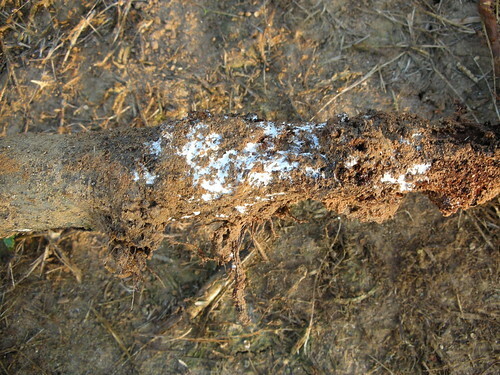 The fungus appears on the surface of affected apple roots, often near the collar, as a white or cream-colored layer of mycelia, which may persist for several years on old apple stumps and roots. The wood under the bark of affected roots often shows characteristic bird's-eye or zonate spots. At times, affected roots appear knotted or gnarled. The fungus is a typical white rot pathogen, producing in diseased roots wood that is very soft and lightweight. The pathogen produces spores on an inconspicuous hymenial layer on the surface of roots, on the surface of soil at the base of trees, or in open pockets in soil. This layer is white to cream-colored when it is dry. It is waxy cream to ochraceous buff when it is moist. Aboveground symptoms of the disease include poor terminal growth and small, light-colored leaves. Trees often die suddenly, usually within 2 years after the aboveground parts first show symptoms of the disease. Trees of all ages may be killed by white root rot, although the disease occurs more commonly in older trees. Control of white root rot depends primarily on avoiding the pathogen by not planting trees in soil that harbors it. As with Armillaria root rot, replanting is often not successful. Remove all old roots from a site for two consecutive years before attempting any replanting, and allow a year or two for any remaining tree roots to completely decompose before planting new fruit trees. No apple rootstocks are resistant to the white root rot pathogen. Apple root showing signs of the white root rot fungus. Photo: Turner B. Sutton, North Carolina State University.